Pronounced “tyre” these falls are but one of a multitude that dispense their waters into the Oxley Wild Rivers National Park and ultimately into the Macleay River that runs through Kempsey. 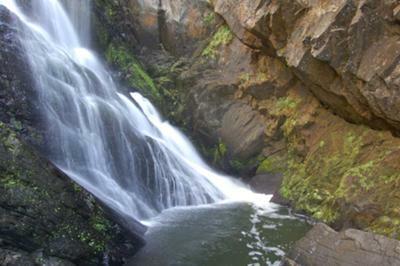 These falls are not anywhere near as popular as the nearby Apsley, nor are they as dramatic. No, these suit the keen bushwalker who seeks solitude and a wilderness experience. You can, as suggested elsewhere, go for the long view or you can head up the eastern side of the gorge which is particularly colourful in late winter/early spring when the wattle is in bloom. You can also get up close and personal, do a rock scramble, and get an entirely different feel for the cascades, as I did on my third trip in.